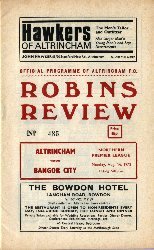 This page attempts to give an outline of the development of the Robins' Review, the matchday programme of Altrincham Football Club, and its untitled predecessors. Web-space considerations limit the amount of illustrative material on this page but it is hoped to reproduce here changing representative images of the programmes issued over the last sixty years. In time, too, features will be added on famous Altrincham games, home and away. I am most grateful to Terry Surridge for permission to reproduce his four articles on the evolution of the Altrincham F.C. programme from the Robins' Review of 1986-87.
from the Robins' Review matchday programmes of January to February 1987. Right: A programme from 1947/48 season. 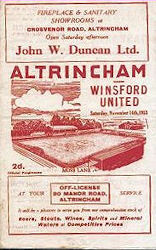 Pre-War Altrincham programmes are scarce. The oldest I have seen is for the game against Stockport County Reserves on 27th October 1934. This game is of particular interest as it was played on a Wednesday afternoon (early closing day) in the hope of attracting a large crowd. The 1934-35 season programme had eight pages and cost two old pence. All profits from programme sales went to the club’s Building Fund. The club name was clearly positioned across the front cover, together with a list of directors and club officials and the date, but not the name of the opposition. However full details of the next home game are included. I suppose that as supporters who purchased the programme were already at the game and knew who the opponents were it was therefore more sensible to advertise full details of the next game! Page 2 carried the editorial chat. This particular issue made a strong case for either exemption from some of the early qualifying rounds of the F.A. Cup. or at least permission to play them in mid-week. This followed Altrincham’s very easy wins against Timperley (6-2), Barnton (8-2) and Moulton Verdin Institute (9-0). The editor concluded that such games did not attract as large a crowd as the normal Cheshire League games that had to be postponed - shades of recent seasons when Cheshire Senior Cup matches caused postponement of important league games. Advertisements fill page 3. It is interesting to note that for 15/- (75p) you could secure one season’s advertising in the programme. The centre pages carried the team line-ups, displayed within the usual border of adverts. The penultimate page has the Building Fund notes and details of the social committee’s forthcoming events. Apart from the weekly whist drives and social evenings, tickets were still available for the Annual Picnic to Blackpool. They cost 7/6d (37 and a half pence) and included high tea or dinner. Programmes for seasons 1935-36 to 1937-38 are very similar. They were the same size and same price and, although the front cover design was slightly changed last season, it contained the same information. Adverts have always bean an important part of a football programme. There were, and still are, essential to help subsidise the printing of the programme. Advertisements in pre-War Altrincham programmes included Bowlands’, Regent Road (opposite the hospital), with all your needs for home decorating. Who can remember such wonderful names as Cebino (a new ceiling distemper), on Radiolin (a gloss paint) and Tredonit (the paint for floors)? Unfortunately I have not seen programmes from the 1938-39 season or the 1939-40 Wartime leagues! I would be delighted to hear from anyone who has programmes from these seasons. 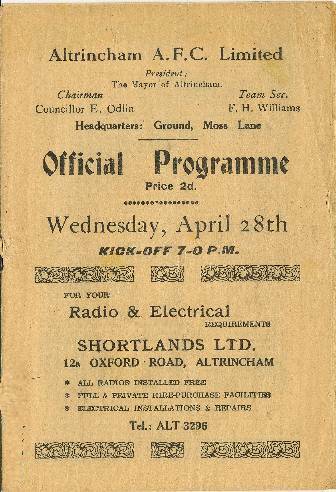 Altrincham did not play in the first post-War season, 1945-46, when Moss Lane was used by a newly formed team, Altrincham Amateurs. Can anyone tell me whether they printed programmes? Unfortunately, I have no Altrincham programmes from the 1946-47 season. Programmes from the following season [pictured right] were smaller than pre-War issues. They still cost 2d. and had eight pages with plenty of advertisements. The 1949-50 programme introduced the front cover drawing of Moss Lane. Apart from a certain amount of artistic licence (showing terracing where none existed), the drawing gives a general impression of the ground and was to become a familiar cover through into the 1960s. For 1952-53, the programme became one large sheet, folded into three to give six pages. The following season saw a price increase of 1d. to finance a lucky number competition in which the winner received a season ticket. Unfortunately that competition was short lived as the police soon stopped it and the programme immediately reverted to 2d. The programme for 1955-56 was reduced to four sides, and increased in price a year later to 3d. 1959-60 and 1960-61 programmes are very scarce - the club's fortunes hit rock bottom, the ground had deteriorated, results were bad and the Robins had the humiliation of seeking re-election to the Cheshire League in 1961. The club’s low fortunes were reflected in the few programmes that I have seen. For the game against Wrexham Reserves on 12th December 1959, the programme was a four-sided issue, costing 3d, and apart from the teams it contained only adverts. 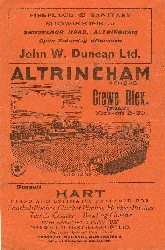 As is well known, 1961-62 saw the start of the rebuilding of Altrincham Football Club and the programme was seen as important. It became very informative, excellently printed on a better quality paper and echoed the professional approach of the new management. In the programme for the opening game of that season the new Chairman, Mr. Peter Swales, said: "The months of hard work by staff and supporters are on show today...a new look ground and a new look team... We think Altrincham F.C. has gone a long way to being rebuilt in the last three months". It is interesting that the drawing of the ground used at that time was identical to that used in 1949. Included in the first issue of 1961-62 is a photograph of the Karl Denver Trio, visitors to Moss Lane over 25 years ago. Can anyone remember them now? Left: Programme for a pre-season game in 1962-63. 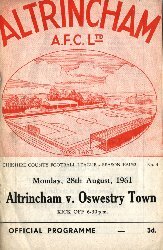 The Robins’ programme grew in size from eight pages in 1961-62 to twelve the following season and sixteen in 1963-64, which was the last that the drawing of Moss Lane featured on the front cover. 24th August 1964 heralded the first home game of a new season and saw a new programme design which lasted only twelve issues, before the game against Sankeys on 12th December brought another cover design and a change of printers to John Roberts and Sons of Salford. There was little change in the design over the next four seasons, but the programme on 4th May against Witton Albion marked a special occasion for the Robins with the first home match in the club’s history to be played under floodlights. The present title of ‘Robins Review’ was introduced in 1967. During 1967-68, a different player’s photograph featured on the front cover of each home programme. Inside, details of the opposition appeared and have remained as standard features since then. A change of league in 1968-69 did not bring a change in programme design, apart from the absence of front cover photographs. The layout remained basically the same throughout most of the Robins’ days in the Northern Premier League. The early 1970s saw an increase to 20 pages, accompanied by the usual price increase, to 9d, and then, in 1971-72, to 5p. The club’s last season in the N.P.L. was marked by, for me, the best programme layout up to that date. 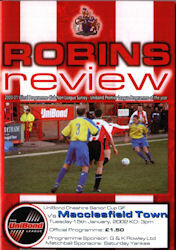 The words "Robins Review" appeared vertically between red and black vertical stripes, which on the white background emphasised the club colours. A different photograph featured on the front cover of each match programme. Understandably the opening issue saluted the Wembley success of the previous season. John King was shown receiving the F.A. Trophy after the Robins’ 3-1 success over Leatherhead. The cover photograph on the cover for the match against Boston United is one for the scrap book as John King, Barry Howard and a very smart Stan Allan posed with Spurs’ Argentinian World Cup stars Ricky Villa and Ossie Ardiles after the clubs had met in the F.A. Cup at White Hart Lane. Those old programmes can certainly bring back memories! Since the inaugural season of the Alliance Premier League in 1979, each season has seen an equally impressive, yet different, cover design. Inside, action photos from previous games were introduced and have remained a popular feature. 1980-81 saw a price increase to 20p but after five issues with an increased page size, the programme returned to its present A5 format. Duplex came and went during 1981-82. Despite the eye-catching full-colour front cover and the increased content with the ‘On Target’ insert, for me, the individuality of the traditional Robins' Review was lost. One half of what I read in Altrincham’s programme one week, I could read again in Boston United’s or Kettering’s soon afterwards. After 22 issues, the Duplex firm closed down and the final ten issues of the season were all four-page, typed emergency issues. Unfortunately, these included the F.A. Trophy semi-final against Wycombe Wanderers. The past four seasons (1982/83-1985/86) have maintained a balance between information, statistics, photographs, articles and, of course, advertisements. Unfortunately, the price has increased considerably - reflecting the ever rising costs of printing. I would like to thank those readers who have contacted me about the articles on programme collecting in general and Altrincham programmes in particular. For those supporters trying to collect complete seasons and wanting to know if a programme was printed for a particular game - especially friendlies and postponed matches - I will compile complete lists, season by season, later in the year and let you know through the Robins' Review when they are ready. Generally, until recent seasons, there was usually a normal programme for friendly games, and interesting examples are from games against Northern Nomads (26th September 1953) and Rochdale (5th August 1968). Finally, for my own research, I am still desperate to find programmes from 1938-39, 1939-40 and 1945-46 (when Altrincham Amateurs played at Moss Lane), if they were printed in these seasons. Information on any programmes from 1959-60 and 1960-61 would also be very welcome. I can be contacted by post, care of the Club, if anyone can help me out. When Terry Surridge wrote the above articles in 1986-87 season, the programme was typically 24 pages in size and cost 40p; it went up to 50p in 1988-89 and increased in size the following season to 32 pages. Another price rise, to 60p, came in 1990-91 and a year later the cost went up again, to 80p, and by 1992-93 it cost £1 for the same 32 pages. Paul Brady, who had edited the programme so well for a decade, handed over to Mark Harris and Terry Surridge from 1991-92. The pagination grew to 36 for 1995-96 but 1996-97 saw a radical change, with a larger format, a larger price of £1.50 - and larger print! Relegation from the Conference in 1997 saw a reversion to the former A5 size for the UniBond Premier season of 1997-98 and a price-cut to £1.20. As well as cutting the price, the new editor Robert Muir also enlarged the publication to 40 pages. The current editors, Grahame and Terry Rowley, took the helm from 1998-99. 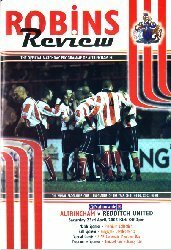 The price rose to £1.50 (for 44 pages) for the one-season return to the Conference in 1999-2000 and remained at that level until the 2005-06 season, despite becoming a virtually all-colour production in the interim. In 2005-06, with promotion back to the Conference National, the price went up to £2, a price it still retains in 2011-12. The Robins' Review received deserved recognition by winning the Wirral Progamme Society award as the best programme in its division five years in a row (2000/01 to 2004/5). Don't forget that you can buy old Altrincham programmes (home and away) from the Robins' Shop at Moss Lane!